Protocadherin. There are some genes that we have mentioned less frequently on our blog than we should have. PCDH19 and CDKL5 are two examples of this. With this post, we try to catch up by reviewing some of the new findings related to PCDH19 Female Epilepsy including the role of neurosteroids, anti-NMDA receptor antibodies, stiripentol and the mechanism behind this epilepsy. Epilepsiome format. All right, let’s try something new. As we are having a slow start to our Epilepsiome project, we felt that we would start building some of the elements on our blog, before your eyes. PCDH19 will be one of the first genes to be “epilepsiomed” and we will start by moving the more general parts of this to a static webpage that we will slowly expand and make more systematic with link to a list of variants and the emerging ClinGen and ClinVar projects once they are fully functional. Phenotype. PCDH19 Female Epilepsy is a genetic epileptic encephalopathy characterized by an explosive onset of seizure clusters in late infancy lasting through childhood. Seizures are so violent that they often require admission to an intensive care unit and they can be refractory to antiepileptic medication. Most affected females have some degree of intellectual disability or autism. Genetics. PCDH19 was first identified in families where girls were affected by epilepsy and seizures, but where transmitting males were apparently unaffected. It was therefore named Epilepsy with Mental Retardation limited to females (EFMR). This is usually the reverse of what we see in X-linked inheritance. PCDH19 was eventually identified as the causative gene and by 2015, more than 140 patients have been reported. Haploinsufficiency appears to be the pathogenic mechanism in affected females, but males with mutations are not affected. Mechanism. The PCDH19 protein is a protocadherin, a neuronal adhesion protein that plays an important role in early development of the Central Nervous System. Neurons grow and connect through cues on the surface and cell-cell adhesion proteins are critically involved in this. It is entirely unclear how perturbation of this mechanism leads to seizures, but it is assumed that the co-existence of neurons carrying PCDH19 and neurons deficient for PCDH19 create two populations of neurons that have problems interacting. This hypothesis is unproven, but provides a framework why PCDH19 mutations may be pathogenic in females. Community. 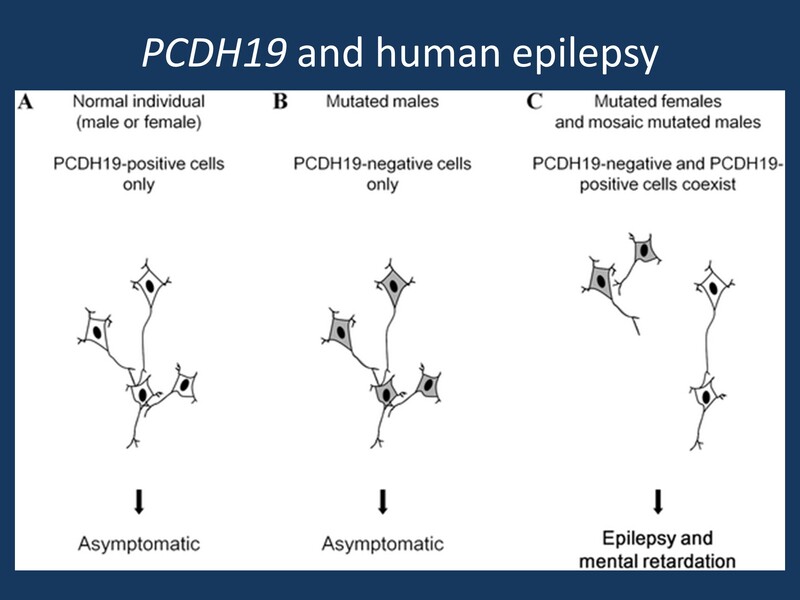 The PCDH19 community is very active and the PCDH19 Alliance maintains a frequently updated webpage about the most recent findings and research activities regarding PCDH19 Female Epilepsy. Here are the things to know about PCDH19 in 2015. Neurosteroids. A gene expression study by Tan and collaborators suggests that enzymes generating neurosteroids are downregulated in patients with PCDH19FE and that patients have lower allopregnanolone levels than age-matched controls. Given that neurosteroids have strong anticonvulsant properties, the authors suggest that influencing this mechanism may be a potential therapeutic target. Dysregulation of neurosteroids may be one of the downstream consequences of PCHD19 haploinsuffiency and future research will help us understand to what extent this phenomenon is relevant in clinical practice. Corticosteroids. A small case series by Higurashi and collaborators suggests that corticosteroids may be used during seizure clusters and may lead to the short term resolution of seizures. Steroids can be powerful antiepileptic medications that are also used in other epilepsy syndromes and it will be interesting to see whether other clinicians have made similar observations. Given that we mentioned neurosteroids earlier, I just wanted to point out that corticosteroids are related to neurosteroids, but are different compounds. Anti-NMDA receptor antibodies. The same case series by Higurashi and collaborators suggest that antibodies to NMDA receptors can be identified in a significant number of patients with PCDH19FE. The authors speculate about a breakdown of the blood brain barrier during seizure and a subsequent immune response that is driving the seizures. A confirmation of these findings in an independent separate study may help us judge the relevance of these findings. Currently, there is little evidence from other studies that this mechanism is relevant in PCDH19FE. Stiripentol. A single case report by Trivisano and collaborators report suggests that stiripentol may be helpful in treatment. However, the patient reported in their study was already older (10 years) and it is difficult to distinguish the medication effect from the spontaneous resolution of seizures that occur in some patients. In an earlier version of this post, I mistakenly quoted the age of the reported patient as 20 years (see below) There is some evidence from the PCDH19 support community that stiripentol may be beneficial in PCDH19 Female Epilepsy, but this has not yet been addressed in systematic studies. This entry was posted in 2015, Epilepsiome, Epileptic encephalopathy, Familial epilepsies and tagged Dravet Syndrome, PCDH19, PCDH19 Female Epilepsy. Bookmark the permalink. Thank you so much for this review of the latest research! One small correction. The case study in the Trivisano paper on Stiripentol (STP) was 9.5 yrs when put on STP, and 12 when the paper was written, not 20. This still is an age where spontaneous resolution of seizures could have happened. However, we know from our family support group and other contacts that other girls around the world are having good results with STP. Further studies with a larger number of patients is indicated, and would be very helpful to understand the effectiveness and side-effects of this treatment for PCDH19 related epilepsy. thank you so much for your comment and for pointing out this mistake that I have corrected in the blog post. I have also added a brief comment about the feedback on STP response that you have received within the PCDH19 community. I agree that systematic studies on STP response in PCDH19 FE would be very helpful to understand the magnitude and nature of this effect.